Spend the afternoon kayaking the moving water of the Colorado River in the Lost Pines Region, pull up to a private campground on the banks of the river and find that all the campout equipment is waiting for you to relax the night away. The next morning you wake to have breakfast and coffee before heading back onto the water to finish up the final section of the river. 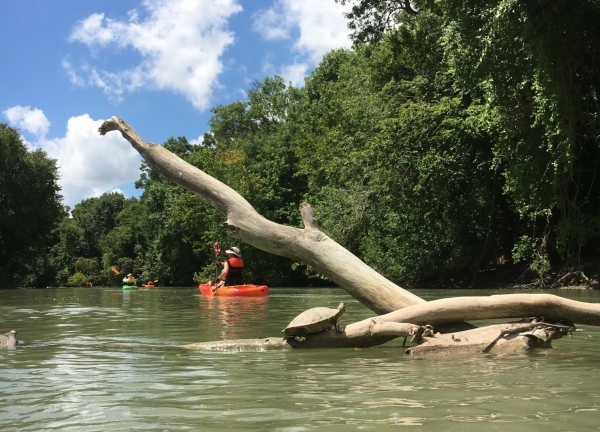 This overnight paddling experience covers nearly 20 miles of meandering river and includes an overnight stay at a private campground area on the banks of the river. REI provides all the paddling equipment as well as your tent, sleeping pad, camp chair, and meals. Please bring your personal sleeping bag and misc. personal supplies shown on the equipment list. Recommended for those 14 and older; those under 18 must be accompanied by a parent or responsible adult.